L'article a été vendu.Cet article a été vendu pour CHF 556.00. Tre Tacche! Canadian Retailer BIRKS! CK 2111! 23,4 SC! Top! 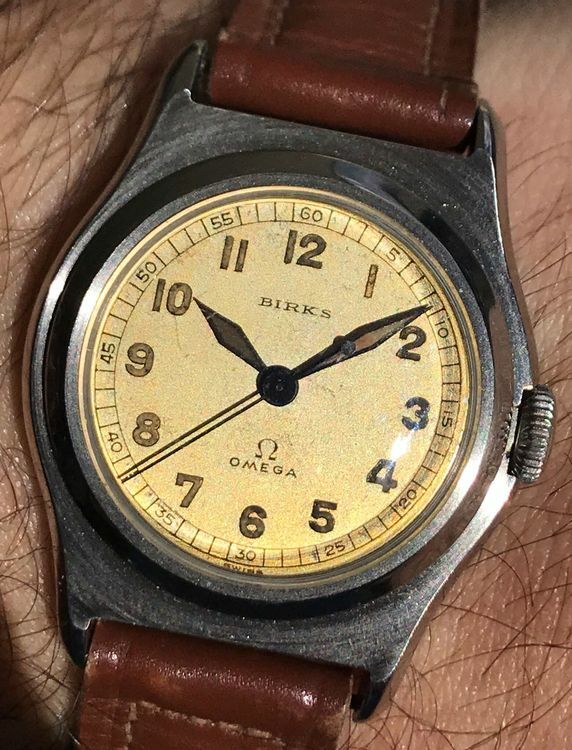 Very nice and all original vintage 1940 OMEGA Medicus Waterproof *BIRKS* mens art deco watch! The watch is unpolished with a stainless steel case of 30mm diameter and with screw « tre tacche » back. 37mm from lug to lug. Super nice and great condition for an art deco 40s vintage watch. Please refer to clear pictures. Top condition! Really a beauty! The watch works properly and keeps accurate time. Manual-winding movement OMEGA calibre 23,4 SC with center seconds. The worldwide first calibre with center seconds! Stuning original silvered OMEGA dial with arabic radium indexes and swords military radium hands. Dial co-signed *BIRKS*, canadian retailer. Very rare to have the OMEGA name and logo at 6 O’clock! Comes on its original used brown leather strap and generic buckle.